One of my failings as an artist is that I don’t spend enough time in galleries and museums, soaking up the creative juices that inspire my contemporaries. 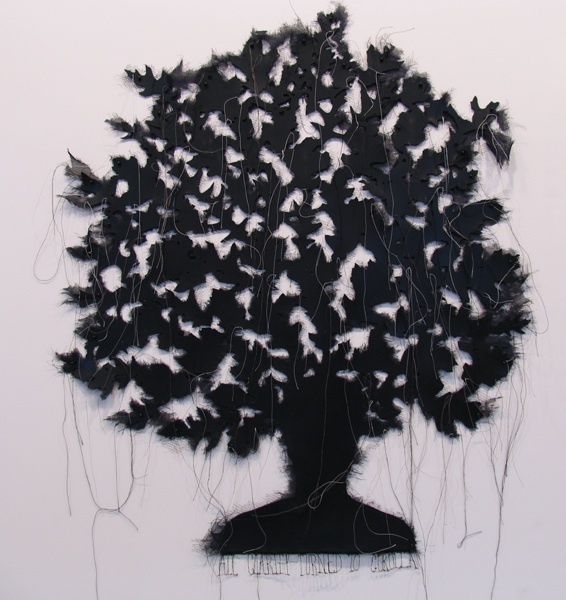 I was drawn to Lamont Gallery for two reasons: one, it can always be counted on to exhibit a strong, cohesive body of work that has something to say, and two, this particular exhibit was an examination of text interwoven as visual elements in the work. And, New England Wax and its members are currently preparing to develop a text- or word-driven project as a group challenge and possible exhibit. Look for more references to that project in upcoming blogs. Upon entering Lamont Gallery, at Phillips Exeter Academy in Exeter, NH, the visitor is greeted by a wall-sized, visual representation of an interactive poetry slam. Haiku phrases, free verse snippets, rhymes, and other verbal insights are placed randomly on a black background that makes one think of celestial bodies in a night sky. Visitors/viewers could participate and add to the galaxy of words or respond to phrases already posted. The exhibit made clear the longstanding intentions of the artists and their commitment to the potential of word as a visual element. It was evident that these particular artists have been exploring this avenue for some time. Melanie Mowinski’s works included clear panels of plexiglass enclosing miniature pages of her 20 years of daily visual diaries. Each panel, suspended from the ceiling in a ladder of panels, enclosed one page per year, and each ½” square represented one day. 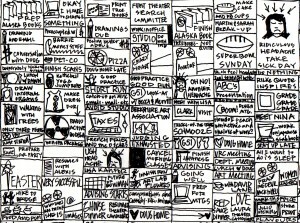 Mowinski chose one item per day to include in each square and meticulously drew small squares in grid or calendar form for the year to portray 20 panels for her 20 years of studio practice. The tiny drawings linked together the picture of each year. Magnifying glasses were available to see them more clearly. 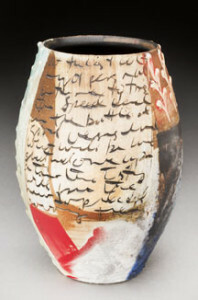 The compelling ceramics of Maureen Mills used text as texture on vessels small and large in rich, vibrant colors. Mills uses the text not as a readable message but as a separate visual element and part of the whole. Her flawless vessels carried text that stretched out the words into a sort of meta-language or secret code that only she might know. Her ceramics work is beautiful and engaging and does not rely on the text to interest you, but it is an added element that draws you in and causes you to wonder about its story and its hidden mysteries. The story is hiding out in plain sight, so to speak. 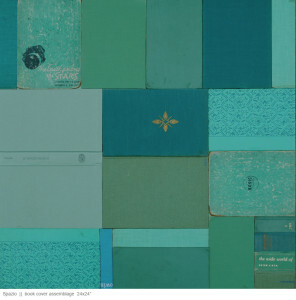 Lisa Occhipinti, Peter Beaman (with Elizabeth Whitely) explore the book and its structure to construct clever sculptures from re-purposed books. Using the book forms to fold, bend, and re-design the books and words, they make all things new again and transcend the ordinary book form. Occhipinti’s fragile, white-on-white digital prints, enlarged and framed as portraits of gentle folds of paper are ethereal and almost lacy. 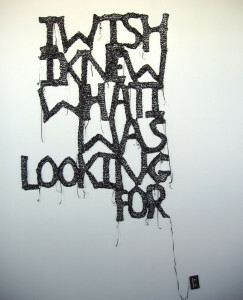 Nicola Vruwink, with her cassette tape wall pieces, reminds us of the endless possibilities for media as she crochets or knits the cassette tape into wall signs that bring a little levity to the exhibit as one of her wall piece exclaims, “I wish I knew what I was looking for.” Don’t we all…. ? Vruwink installed the pieces onsite and the installation was open to the public. Liz Maugans’ printed signs use words to exclaim or plea or exhort. 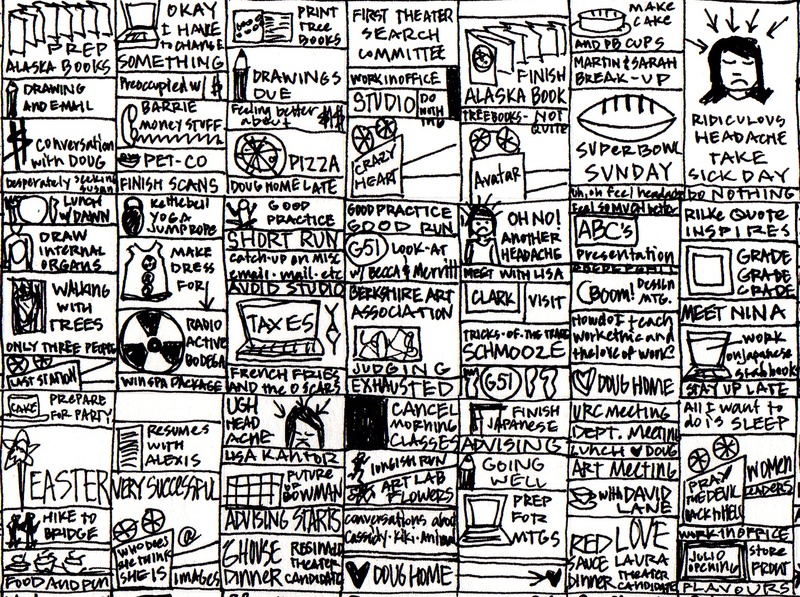 She draws her inspiration from conversations and Craigslist postings. One of my favorites is from a woman who is about to be placed under house arrest and who is pleading for a sale of her jewelry to give her enough money to have a really good time in her last hour of freedom—“Gorgeous Necklace”. Poignant, yes, but it made me laugh. 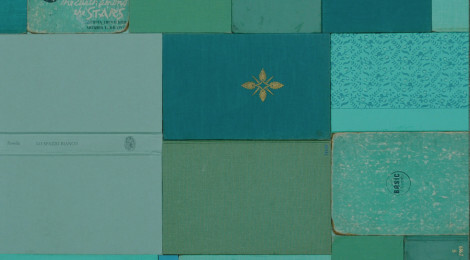 Lesley Dill is inspired by the poetry of Pablo Neruda and she creates in response to his words, in particular a poem entitled “Waves.” She also has an array of fragile books that include hand-rubbings of various trees. One can almost feel a gentle breeze blow through the room in concert with carefully paging through the handmade papers with their impressions of bark. Another of her works used hand-cut letters to build a sculptural bust that is both delicate and strong. Juan Manuel Echavarria exhibited his video and photography work in which he allows language to bear witness to structures of violence and offers hope in response to them. I found this exhibit inspiring and uplifting. It is not an in your face kind of exhibit. It is subtle and finely crafted. As curator Lauren O’Neal states, “what words say is not necessarily what they mean.” This exhibition closed on Oct. 19, but you can look up the websites of these individual artists to see more of their work. As with all fine exhibits, I came away re-energized and ready to get back into my own studio.